The way we work has seen a revolution over the last 10 to 20 years. Advances in technology and cloud computing have removed the barriers to where we work and made it possible for us to work from virtually anywhere with an internet connection. More modern start-ups are embracing this approach to attract top talent who value their free time. With this change has been a move to more open plan office layouts which promise obvious benefits - open communication, collaboration, idea-sharing, and in theory, improved productivity. Open plan environments have also been criticised by some, who say that with phone calls, conference room meetings, and multiple office conversations all simultaneously happening in one big open space, it is increasingly difficult for employees to remain focused on their work. More traditional industries, recruitment included, have been slower to follow this trend, but are now starting to catch up. In an industry where staff attraction and retention are key to success, offering a modern working environment with flexibility in terms of when and where you work, is absolutely essential. Since 2012, Newman Stewart’s head office has been based at Bowcliffe Hall in West Yorkshire. A stately home built between 1805 and 1825, this isn’t a building you’d associate with modern working, although it has served us well. Through offering exceptional executive search services with proven results, we have seen continued growth, recently adding several key members to our team and launching an Associate Trainee Programme. 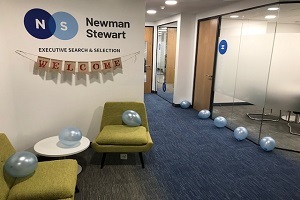 This has meant that we have outgrown our space at Bowcliffe Hall, but also that the company has evolved and needed a new office space that represented Newman Stewart 2.0. Our new modern, environmentally sustainable HQ, Based in Aberford, near Leeds, will enable us to work more collaboratively so that we are even better placed to serve the needs of our clients and candidates. With two open plan floors, we have fully refurbished the building to bring it in line with our needs, including several separate conference and meeting room spaces for interviews and more confidential meetings. The space is also light and bright, reflecting the positive company culture, with the odd branding element and wow factor to put our own stamp on the space. Modernising your work space could mean the difference between securing the top talent in your industry and missing out to competitors. Take a look at what we did to update our new space.